Artificial intelligence (AI) is no longer science fiction. It is driving innovation in a wide variety of industries, from unsurprising suspects like software-as-a-service to less expected applications including advanced manufacturing and automotive. Are you looking for an ecosystem that has a strong record of helping applied AI companies grow? Or, are you interested in integrating AI into your existing business but need help identifying solutions and opportunities for innovation? Either way, our community can help your business take advantage of this new and exciting technology. We’re home to one of the western hemisphere’s top AI universities, a fast-growing AI business community, a world-renowned technology ecosystem, incredible applied AI research assets and a fast-growing pool of top talent. 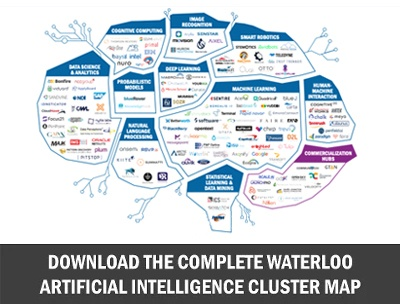 With over 90 companies operating in ten different areas of AI technology, Waterloo has an expansive AI ecosystem, offering a range of products and services. These companies work in image recognition, machine learning, human-machine interaction and more. This collaborative ecosystem includes industry giants like IBM and OpenText, scaling companies like Vidyard and North, and a large community of startups. For businesses working in the AI industry, these 90 companies are potential partners and resources. For businesses looking to integrate AI into their operations, our ecosystem is full of technology vendors that can make adopting AI at scale a much simpler process. In fact, our community can even help you set up an innovation outpost that will supercharge corporate innovation and allow your company to implement AI capabilities quickly. The University of Waterloo (UWaterloo) is one of Silicon Valley’s top recruitment schools for a reason. One of the top technical schools in North America, UWaterloo has Canada’s #1 Computer Science program, #2 Engineering program, and the world’s largest collection of math and computer science talent. UWaterloo is also home to the world’s largest co-operative education program – many students graduate with two full years of on-the-job experience. Businesses participating in co-operative education get access to fresh ideas at a low cost and have an advantage when recruiting these students when they graduate. Waterloo's talent pipeline can help businesses grow. Home to the AI Institute, UWaterloo is now one of the western hemisphere’s top five AI universities. Unlike many theory-oriented research groups, the AI Institute puts equal emphasis on foundational research – machine learning, human-machine interaction, etc. – and operational artificial intelligence, which takes an application-driven approach. UWaterloo’s long track record of partnership with industry allows them to deliver effective AI innovation support for thousands of businesses across Canada, including startups, small-to-medium enterprises (SMEs) and corporations. The ultimate goal is to democratize access to AI, ensuring businesses of all sizes have access to these technological advances. In addition to its research assets, Waterloo is home to a world-renowned industry support network intent on helping businesses grow, create new products and scale. This network includes the Communitech Hub and its offshoot, the Data Hub, the Velocity program and the Accelerator Centre, which is one of the world’s top university-linked business incubators. Want to learn more about how Waterloo can help your AI or technology business grow and innovate? Contact us! Our team can provide in-depth information about the Waterloo AI business community, make connections with local business leaders and much more.